Now it is time to charge headlong toward the Yuletide season. We are ready at Heirlooms & Comforts to do just that. Down come the haystacks and pumpkins, and up go the Santas and Herald Angels. We will be looking for the appropriate fabrics to make those table runners and napkins and even some ornaments. Have you gotten the stockings completed? This Grandma managed to get the additional two done before leaving for a Texas Thanksgiving. Some of our holiday fabrics remain and they are the latest arrivals into the shop. They are very pretty; so if you are not done there are still some great things to work with. And by the way, if your personal Santa has not received your wish list yet, let him know that there are some really good prices on our Husqvarna Viking sewing and embroidery machines and software. Send him in to Heirlooms & Comforts for the great help our staff can offer. We also issue Gift Certificates so that the recipient can make her own choices. Be sure to convey all this information to your Santa. Husqvarna Viking is offering a $500 Rebate on the purchase of a Designer Diamond deLuxe from now until December 15. When you purchase or trade up to a DDDluxe, you get an opportunity to apply for a $500 rebate directly from Husqvarna Viking. What a great chance to save, but it ends on December 15, 2011. Look on the H-V website to get more information. At Heirlooms & Comforts this week we will feature our Clean Off the Bolt special. If you clean off a regular price bolt of fabric you get 25% off the original price. We have a large number of skinny bolts in the regular price fabric racks. Also, if you clean off a sale priced bolt of fabric you get an additional 10% off the original price of the fabric. So, you could be getting 40%, 50% or 60% off if you take it all. Think of those Secret Sisters and others who would love a "batch" of great fabrics to add to their stashes. At Heirlooms & Comforts from now until December 2, 2011, we can offer you 24 Months with no interest financing on your purchase of a Husqvarna Viking machine or Embroidery Software. Two years with no interest, now there's a deal for you. See us soon because December 2 is Friday, you know. We will help you with the application for the GEMoney Home Design Card and process the sale for you. We're ready; come on in. Give thanks! What an open request this is. We can be thankful for so much in our generously blessed lives that it is time-consuming to try to enumerate each category, not to mention each item. Our individual faiths dictate the supreme thanks and our personal experiences dictate our inter-personal gratitudes. This season of the year gives us an opportunity to remember and to voice our feelings. At Heirlooms & Comforts we would like to give a collective thank you to all our wonderful patrons who visit us from day to day and have become integral components of our business family. Your beautiful faces and personalities have become the joy of our daily business life. Thank you for making our days! Reopen for regular hours 10-5 on Monday, November 28. Recently we pointed out a winter (holiday) print to Gail Sexton and instantly she declared that it needed a snowman. She gave it a snowman and friends in a matter of a day or so, and now the resulting wall hanging is a Last Minute Class. Gail has created a pattern for the delightful wall quilt that is about 24"-27" square and is offering it to you as a class on November 28 and December 5, Mondays, from 10:00 to 1:00. There is a $3 pattern and a $48 tuition for this class. You go home with a friendly snowman design that has your choice of cats or dogs with the jolly fellow and with your choice of hat style on the snowman. Really, this is one of the nicest designs we have seen for the winter! This promises to be a great learning experience. See it soon and register for the class. At Heirlooms and Comforts this week we will continue to offer Christmas Motif fabrics at 30% off regular price with a 1/2 yd minimum cut. Remember that we will be open only for three days this week; so get into the shop before you begin cooking for the holiday or traveling for Thanksgiving so that when you are "stuffed like a turkey" you will be ready to sew and sew. This is sure to "stabilize" you and your center of gravity! Cream butter and sugar in electric mixer until light in color and fluffy in appearance. Sift flour before measuring. Alternately add eggs and flour and salt, beating as little as possible to thoroughly mix. Fold in extract, blending well. As high school friends approach and pass fifty-year anniversaries they begin to gather for a celebration. We had such an event recently among those of us who graduated from D.W. Daniel High School with folks who completed high school from 1958 to 1963. That kind of occasion is always fun and a little bittersweet for remembering classmates who have passed away from this life. When we met on November 5, little did we know that two beloved members of that group would be in such trauma and loss within a week's time. It is with saddened heart that we offer our collective sympathy to the family and friends of Linda Webb Martin who lost her life as a result of injuries in an auto accident last week. She and Joe were married for 53 years and set such an example of love and joy for all of us in that wonderful marriage that was blessed with three great children. All have become great friends of Heirlooms & Comforts in the years we have been in business. Those of you who enjoy Cheryl's embroidery classes will remember Linda and her enthusiasm for stitching even when the awful specter of Alzheimers began to dim her capabilities for remembering how to do the next step. Such a gentle person and so appreciative of the kindnesses offered for those of you who saw her often. Heirlooms and Comforts was her haven away from home and we will miss her. Linda, my admired friend from childhood, fly freely with the angels! At Heirlooms & Comforts this week we will feature 30% off Christmas motif fabrics. There are a number of really pretty Christmas holiday fabrics in our shop just now and you can choose some really great motifs for your holiday sewing and decorating. Some of the motifs are just plain fun for the kids and those who are young at heart. Ask about the ten-minute table runner and look at the sample that Sue sewed for the holiday display. Of course, the better selections are available for the early shoppers. Don't wait too long to choose your favorites at 30% off (half-yard minimum cut, please). At Heirlooms & Comforts we are looking forward to seeing all of those who are joining us for a special program on the use of stabilizers on Friday. We expect a great presentation from Viking Educator Gail Dodson that will be beneficial for all of us who like to appliqué and embroider. Fallin'! So what does fall season do for you? Do you get a particular mood when the leaves begin to fall and the temperature begins to fall? Does your disposition begin to fall? I think that a study of personal moods in autumn would provide quite an interesting contrast of conditions. For me, there is an energizing force somewhere in all the color and the briskness and the anticipation of coming holidays and family times. I look forward to the aromas that come with the autumn season. Think of the odor of smoke curling from the chimneys as folks begin to warm themselves by a crackling fire. Think of the aroma from the kitchen as we bake apples, pumpkins and sweet potatoes. Add in those special breads and cakes and pies. (In the south you kinda just go with the flow when the turnip greens and collards are cooking. Instead, think of the cornbread to go with those greens.) Hot soup is soul food when combined with that cornbread. After a brisk walk, how about snuggling in a cozy quilt to read a book (or your e-reader) or to whip down the binding on that last quilt you just quilted (or received from the longarm quilter). Quilt making just seems to "fall" into fall. So we are looking for you in the shop soon to select your next projects! At Heirlooms & Comforts on Saturday, November 12, we will NOT be open at all because the Clemson home football game with Wake Forest is starting at noon. This game will mark 53 years that Bobby has been to every home game that the Tigers have played. Can't miss this one. Thanksgiving Holiday Hours - Close at 2:00 PM Wednesday, Nov. 23; reopen Monday, Nov. 28 at 10:00 AM. At Heirlooms & Comforts on November 18 we are hosting a Stabilizer Event with Gail Dodson, Viking Educator from the west coast of USA. She will be demonstrating the use of machine embroidery and machine appliqué, and how stabilizers aide in making those designs great in the stitch-out. She will discuss which needles and the styles and uses of certain ones. If you have already called to sign up for this all-day session, which includes lunch that we serve, please send your tuition or call with a credit card payment to secure your seat in our limited space. Also, we want to have the count correct for lunch. All day November 18, 10:00 AM to 3:30 PM with lunch and a "goodie gift bag," related to stabilizers and embroidery (10 free designs) for a tuition $15. Yet another bargain! Complete your registration with payment to reserve your seat. At Heirlooms and Comforts this week we will feature any one item of your choice at 25% off. The item can be anything in stock with the exception of machines, sergers, cabinets, and embroidery software. You choose; you save. The other thing that autumn means locally is that Quilting in Toccoa - Fall 2011 is this week (formerly known as Quilters' Rescue Mission or R&R Retreat). That means that Sara has loaded the trailer again and made the shop look funny. We will be normal again after Thursday. In many venues of the working world, life is based on quarters (not to be confused with Fat Quarters, although some managers would like more "fat" quarters). As this week is the last in the 3rd quarter of 2011, we should begin to prepare for the ending ¼ of the year. This includes Halloween, Thanksgiving, and Christmas. We have at Heirlooms & Comforts fabrics that speak to all of these holiday times. We can also suggest many effective ways to use these fabrics to enhance your final quarter of this year, even incorporating fat quarters. See us. We can help you make it happen. At Heirlooms & Comforts this week we will continue to feature Fall Themed Fabrics, except now we will offer them at a 30% discount thru October 1 (1/2yd minimum cut, please). There are still plenty of choices remaining in stock. This will help you get ready for the fourth quarter of 2011 filled with sewing fun. Many of you have asked for a basic learn to sew class. Susan Wainscott has agreed to teach this class. It is scheduled for this week on the 28th. Sue will teach you machine basics about threading, stitches to use, and tensions. You will have classes on how to read a pattern, how to hem, how to install a zipper. If you have special requests for specific sewing methods, you can submit those for inclusion in the course. Other sessions for this class will be on Oct. 12, Oct. 26, and Nov. 9. Call to register early in the week. At Heirlooms & Comforts we still have some previously owned Husqvarna Viking sewing machines that are aching to be taken into new homes. There are several Designer Diamonds, a Sapphire, a Designer II, and a #1 all polished up and ready to go. Check with us for the bargains; you'll be glad you did. It is time to really pay attention to the changes around Heirlooms & Comforts. The work on the streetscape is almost complete so that there are changes to be noticed. There is a new spot for the Handicap Parking directly across the street from the front door. DOT regulations change sometimes and the distance between a parking space and a corner is important. The curbing and the "island planters" secure the corner of Bank and Madden Bridge Rd. The new handicap space is also larger and allows for getting a wheelchair or walker out and going in a safer manner on a level surface. There is also a new ramp and a crosswalk (not yet painted in the street, but coming). This will provide safer movement for all of us from one side of the street to the other at the new STOP sign that will go into place at the corner on October 7. Now we will have all-way stopping at the corner, which will slow traffic to a safer speed and also allow us to cross more safely. Although the parallel parking spaces on the sides of Madden Bridge Rd seem to be relocated, there are now 18 spaces in our two-block area whereas there were only 8 marked before. The sidewalk is new and wide and will allow for pulling your machine cart on a smoother, safer surface as you come in for classes and lessons. You will notice new plantings at the front of the shop. Bobby gets the credit for that installation. Hopefully we can keep them alive. We are grateful to the Department of Transportation and the Town of Central for their attention to "our side of the tracks" with this project that has improved the safety and the appearance of the area. Just be sure you are paying attention to the new stop sign that will be in effect on October 7, 2011. At Heirlooms & Comforts we have received a number of great autumn themed fabrics from a variety of sources. We have Halloween prints that are cute. We have harvest prints that are both cute and stylish, some even with metallic gold accent. This week we will feature these themed fall prints at 25% off with a minimum cut of 1/2yd. There is one especially nice stripe fabric that is going to be great in the Striped Table Runner pattern. See for yourself. 25% off Fall Fabrics this week. As we announced earlier this month, September brings some busy weekends in the lives of our employees and customers. Some of us have a habit of attending home football games at Clemson University, and for that reason we will have unusual hours when there are home games. On Saturday, September 24 we will CLOSE AT 1:00pm because the game is set for 3:30pm kickoff. Watch our emails to know when other home games are played and what our hours will be for those days. Thanks for your accommodating our fun times! We have two really good classes about to start that teach how to effectively use embroidery and machine embroidery appliqué. 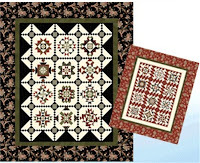 Cheryl Keith has designed these two classes to use your machine's capability beautifully. 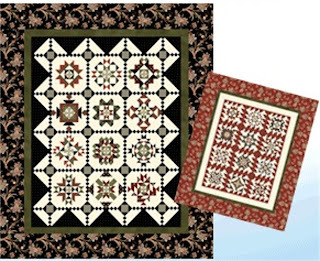 You can make International Sunbonnet Sue blocks and set them creatively to get a really unusual "traditional" quilt. Katagami Quilt And/or you can make a beautiful Asian motif hanging or throw using an embroidery design of the traditional Koi fish and navy/cream fabrics. These classes teach you so much about your embroidery machine you may not know yet. These classes fill fast; so don't hesitate. Complete your registration with payment right away to assure your place in class.